Kelyacha halwa or halwa made from very ripe plantains is my Aji’s specialty. She made it a few times during the Indian monsoons, when the long red plantains (known as rajeli keli) are in season. We ate it as fudge, and Aji sometimes stuffed a version of it into flatbreads to make kelyachi poli. It made going back to school after the long summer holidays much more bearable. The month of Shravan was a special one with many different reasons to celebrate. 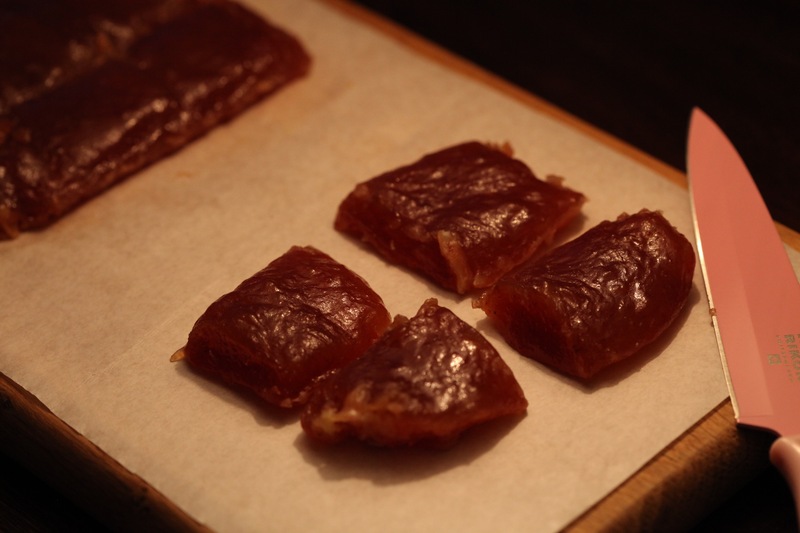 It featured a veritable smorgasbord of seasonal ingredients and festive food and this halwa featured often. Kelyacha halwa is a labour of love, but the final product is worth the time and patience it soaks up. If I were to make a top 5 list of the recipes that I treasure as my culinary inheritance, this would be the jewel in that list. Mash the bananas with a fork, until you have a smooth and lump free mash. Mix the sugar and the ghee in. Add the banana mixture and stir frequently so that the mixture does not stick to the bottom. Keep stirring for about 8-10 minutes which is when it should start becoming thick and sticky. Scrape down the sides and mix the bits in. When it turns a deep golden brown and it is difficult to stir the spoon through the mixture, take it off the heat. The consistency should be that of a sticky toffee or dense fudge. Grease a deep plate with 1 teaspoon (approx.) ghee. Spoon the halwa into this plate. Smooth out the ridges and furrows with the back of a spoon and let cool for a couple of hours. Cut the halwa into pieces and serve. I have used regular Caribbean plantains for this recipe. If you are using sweeter plantains or bananas, you may want to reduce the amount of sugar you use. Some versions of this halwa also call for cardamom powder to be added to it while cooking. I have stayed true to the version my Aji makes and have left this out. This entry was posted in A-Z 2016, Desserts, Festive food, Seasonal food and tagged #AtoZchallenge, banana fudge, banana halwa, epicurious, kelyacha halwa, kelyachi poli, Maharashtrian sweets, Mumsnet Blogging Network, Pathare Prabhu sweets, rajeli keli, ripe bananas. Bookmark the permalink. This looks easy and simply delicious! Yum yum 😀 Your Aji sounds adorable and the halwa is welllll slurrrppppp. I have eaten a similar looking jackfruit halwa which is to die for. Interestingly Monica I bought a large stack of bananas 2 days back and they r ripening as we speak. Now I know what I will do with them , Thanks and am sure its worthy of being cherished . This sounds easy – just bananas, sugar and ghee. I have never heard of halwa but this recipe sounds yummy. Thanks, Soumya. Same pinch! 🙂 Glad you liked this. Wow! I have never heard of that and I think I have seen red plantain but not sure. I am sure it’s like a delicacy. Thanks for visiting, Parul. Red plantains are quite easily found in the monsoons (or used to be when I lived in Mumbai).